An epidemic of Influenza is hitting our cities and taking health care workers by surprise. The viral strain causing this illness is different than the ones in the current vaccine. This problem causes great fear for health care professionals as there is no way that a new vaccine can be brought on line quickly enough to come to our rescue. Knowing the possibility of such a development at any time is why I have been urging all my patients to please get the Interferon for flu extract we developed several years ago. Not only is it effective against all strains of Influenza virus, it is very safe and cost-effective. We have learned from experience with our patients using the Interferon for flu extract that you need only a one or at most two-drop dose to be effective. The key is to use a “rush” approach to treatment, by taking one drop sublingually every 10 minutes for 4 consecutive doses and then one drop every 1 to 2 hours until the illness is brought under control. Thereafter, continue with one drop taken sublingually 4 times daily for 7 days. To administer, you simply drop one drop (NOT dropperful) under your tongue, being careful not to touch the dropper with your mouth, and hold the drop for 2 minutes without swallowing. Then spread whatever is left of the drop around your mouth with your tongue. The Interferon sends a signal through the mucosal cells to activate the immune system. For those who already have the Interferon for flu extract, you can use it to prevent illness by taking one drop (NOT dropperful) twice daily until the epidemic is over. At the first sign that you may have been exposed or feel sick, start the “rush” treatment as described above. If you don`t already have the Interferon for flu drops and would like to order them, e-mail our office at orders@coem.com or fax an order to (843) 572-1795 and we will send the extract via priority mail or overnight FedEx. (Please specify which form of shipment you would like.) A 10 cc bottle containing 100 to 200 doses of extract (1 to 2 drops per dose) costs $44.00 and is enough to treat two people for 7 to 10 days according to the acute infection instructions given above. If you don’t use all the extract now, simply refrigerate the bottle to use later on. Refrigerated extracts remain potent for at least 6 months. In addition, your blood level of Vitamin D may be the critical factor as to whether you are at risk of getting the flu. Be sure you are taking 4000 IU of Vitamin D in the winter months. 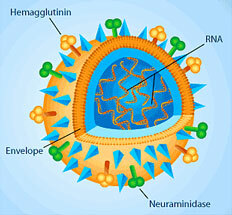 Influenza always occurs when our exposure to sunlight is minimal, which is in wintertime. Sunlight provides our main source of vitamin D and noontime sun is the optimal time for sun-exposed skin to synthesize Vitamin D. Fifteen minutes sun exposure is all you need if you have bare arms and legs. If you have any questions, feel free to call our office at (843) 572-1600.
the many products and services we offer.